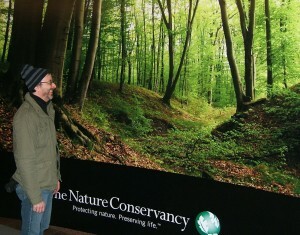 Custom Wall Coverings for Lobbies, Conference Rooms, & Hall Ways. 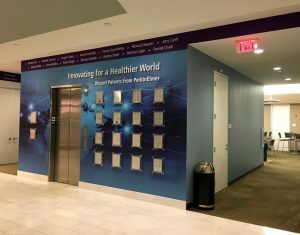 Create striking images on your Lobby Walls to greet visitors with Custom Wall Coverings. Is your office space looking a little…blah? Perhaps you’ve been through the paint wheel dozens of times and nothing is inspiring you…Well, sometimes walls need something more than a fresh coat of paint can provide. 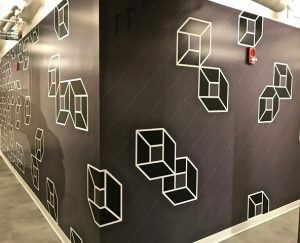 These days, one of our hottest product groups has been Custom Wall Coverings—that should be no surprise, considering the huge visual impact a custom graphic wall can provide. Our clients love the vast array of types, textures, processes, and installations that are available, making each installation truly on-of-a-kind. 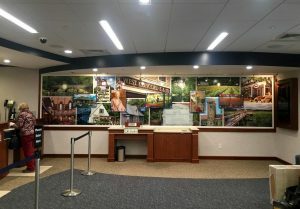 A custom wall mural can turn your plain walls into an attention-grabbing message board for all your customers to see. 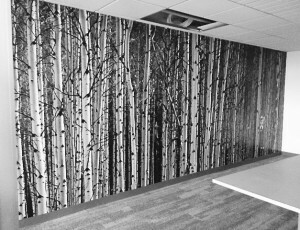 One of the key factors in choosing a custom wall covering solution, is the adhesive used to bind a graphic to your walls. Perhaps unsurprisingly, there are a multitude of options to take into account the many types of walls and the desired permanence of the installation. That is to say, if you want totally custom wallpaper to be installed permanently (or at least until the next Presidential election), we’ve got you covered; if you are looking to spruce up an area for a short-term branding, we’ve got you covered; if you aren’t sure what you want, but you know you want it bold and one-of-a-kind, friends, we’ve got you covered! ICL Imaging’s staff will survey your facility to help you identify the best materials to use for your wall mural, and the steps necessary to prepare the surface for optimum results. This way, you can be assured that your wall murals have been designed specifically for use in your store, for maximum durability and visual appeal. Our team of certified trained installers will take care of the rest. It comes down to 2 choices – Wallpaper or Adhesive Vinyl, But Which One? How long do you plan on having the wall covering up? Short Term, which we define as less than a year or two; or Long Term, which we consider 5 years or even more. Custom Wallpaper performs just like good old fashioned wallpaper: it can be removed fairly easily if the walls have been properly primed prior to the installation. After the wallpaper is removed, the walls can be gently washed with soap and water to easily clean any residual adhesive. Adhesive Vinyl is available in two basic “flavors”: the first is so-called permanent adhesive vinyl. It will perform better than wallpaper in high-traffic areas, is easier to clean but ultimately, it will be harder to remove. For short-term applications, a removable vinyl adhesive is the best choice. Our customers are loving FABJET II—an adhesive-backed fabric that is ultra removable, has excellent opacity and has a water-fast coating for easy cleaning. II. The Second Factor to Consider is: What is the Surface of the Wall? It seems obvious in retrospect, but, the surface texture of a wall can make or break the success of an installation. Rough textures do not generally cooperate with adhesives (you’ll know this effect if you’ve ever tried to tape something to an untreated brick wall). 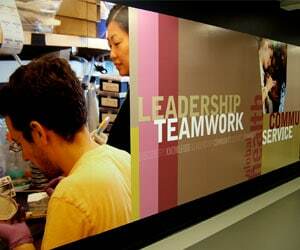 Furthermore, the texture of the wall may show-through the graphic, lending it a bumpy appearance. So while there are specific adhesives for rough surfaces, you need to consider whether that is the effect you really want. Glossy painted walls can also be problematic, because the adhesives just want to slide off. It turns out that eggshell paint is a terrible surface to bond to (although the aforementioned FABJET II works pretty well in this application). So what’s left? Wall surfaces should be clean and smooth. For Wallpaper we recommend a Shieldz brand primer product: Clear, for solid painted walls and White for new walls. When it comes to Adhesive Vinyl, it’s best to use a latex semi-gloss paint and allow it to dry and cure for at least 2 weeks. While that may seem excessive, since the paint is dry to the touch in a couple of hours, it is important to note that paint continues to cure by evaporating water over its lifetime. After 2 weeks, you are usually good to go! Did you know that over time Adhesive Vinyl actually shrinks? Yep. For this reason, when we install it, we overlap the seams to allow for shrinkage over time. You should be aware that these small seams, depending on your image, can be noticeable, but are generally well tolerated. 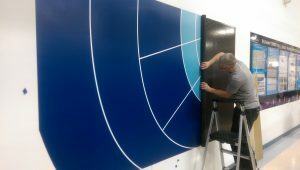 If you want to keep your adhesive vinyl looking great for a long term installation, we recommend using an overlaminate. You have your choice of finish: matte, lustre or gloss. Wallpaper, when it is installed, is overlapped, then “double cut” creating very tight seams with no overlap. Wallpaper materials come in mind-bending variety of surface textures each of which has some influence on the way colors, contrast and vibrance are translated from your original file. Another interesting feature of custom Wallpaper is that it can actually allow for changes to be made after the installation because of its relative ease of removability. 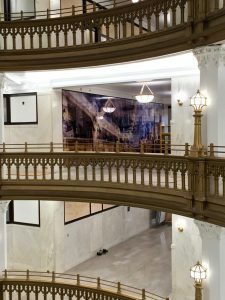 Generally, parts of the wallpaper mural can be changed with little to no noticeable effect after the initial installation. This can be useful when names, dates or even additions need to be made to the original project. Windows and door frames do not play nicely with wallpaper, for example. 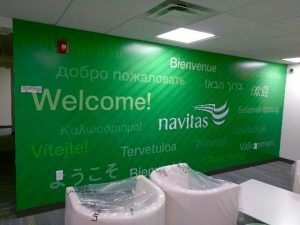 If you want to cover your walls, door and window casings with a cohesive wall graphic, Adhesive Vinyl will conform more precisely to the corners and angles of the casings, and will adhere better with it’s more aggressive adhesive. Preparation is the secret here: before the installation takes place the walls should be spackled and sanded wherever necessary and then wiped clean. Before hanging, we usually determine if the wall should be primed with a white primer to lessen any possible color bleed-through. Priming promotes adhesion and also simplifies removal. As mentioned earlier, for Wallpaper, we recommend Shieldz brand primer products, either Clear for solid painted walls, or White for new walls. 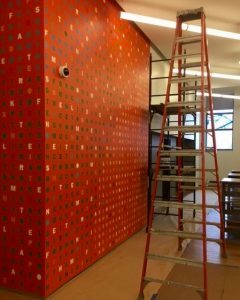 Then, patience is a virtue—you’ll need 2 days for drying and curing before we can apply your custom wallpaper mural. It is important to note, that you must not use latex paint under wallpaper, as the wallpaper paste can actually soften the latex making the paper become part of the wall. This is all well and good until it comes time to remove it. Or not. As the case may be. You have been warned. Under Adhesive Vinyl, we recommend a latex semi-gloss paint and patience. 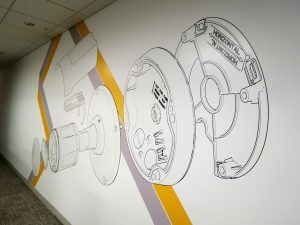 The semi-gloss paint provides a good base for adhesive vinyl, but only if you allow to dry and cure for at least 2 weeks (to eliminate the out gassing that will create bubbles under the wall mural material). You can also use Kilz brand primers, they have shown excellent results and reduce staining and bleed-through problems. Those are ready for the vinyl installation a little sooner—allow at least 5 full days of drying for Kilz. Hopefully that is a helpful primer on the world of custom wall coverings. So put down that color wheel, and give our experienced account representatives a chance to reinvigorate that boring wall! Email us at info@icl-imaging.com, and we’ll be glad to review your wall-covering project and offer you the best solution to your wall mural challenge. Need a price quote for your project? Visit our Quick Quote and fill out the corresponding form to receive a price quote. To learn more about our services, please do not hesitate to call us at 800 660 3280. You may also send us a message by emailing csr@icl-imaging.com. Critical color matching to your specified colors with our PMS based profile system for speed and accuracy. Our triple check quality control process and on-time delivery system will meet your deadline. Four Customer Service Reps, Eight Outside Account Executives and 37 Production and Administration employees will guarantee your satisfaction and ease of doing business. ICL Imaging is New England’s full service large format printer offering a wide selection of materials and output devices. Graphic sizes up to 16 seamless feet wide. We’ve built our 60-year reputation on guaranteed customer satisfaction and high-quality production, with best practices and experienced people that set us apart.